Aconitum: Rust on roses: I read the book “Homoeopathy for Farm and Garden” by V.D. Kaviraj with great interest and enthusiasm. I'm just a hobby gardener but I had great success treating rust on roses using Aconitum. I've never had such beautiful roses!! 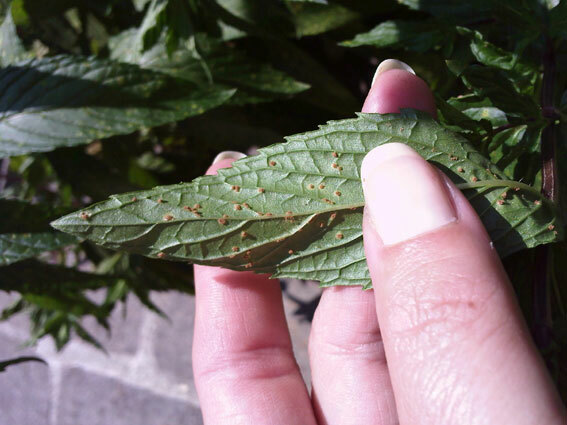 A peppermint plant had an massive attack of rust. I was treated one time with Belladonna C200. The infestation, however, was so massive, that I decided to cut it completely. The new growth was a little slow in coming but is up to now completely healthy and I can enjoy fresh tea again. This year I watered once a month with Acon. 30C und Bell. 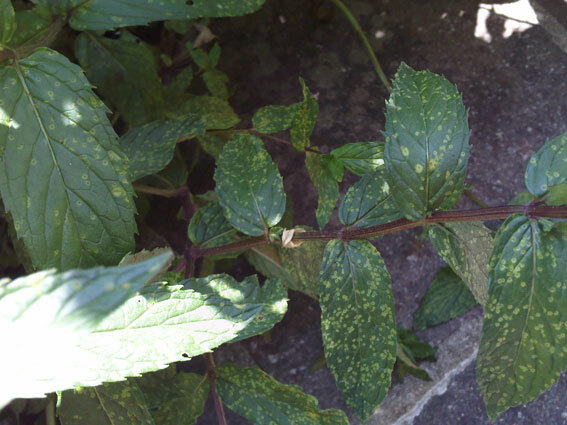 30C, very large flowers, stronger plants and so far very few rust spots on the leaves. The small orchard of fruit and wine grower Christian Berg in Ortenberg, central Germany, contains apple and pear trees over an area of approximately 1000 square metres. The rows of trees face south and are therefore fully exposed to the midday sun, which increases the risk of sunburn in hot weather. Herr Berg had therefore repeatedly experienced problems in previous years. The sunburn causes the fruit to develop golden yellow or brown spots, adversely affecting the shelf life, as the fruit flesh more quickly becomes soft and brown. In 2013 the trees were preventively treated before the hot July weather according to the recommendations of Christiane Maute by spraying them with Belladonna 200 C. When he later checked the trees, Herr Berg found that the treated trees – in contrast to nearby untreated ones – showed no signs of sunburn on the leaves. 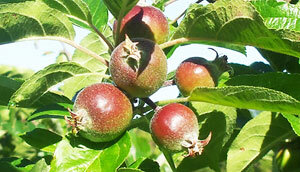 The photo shows the effect of sunburn on the apples. The result indicates that homeopathic treatment was effective, although it does not provide proof. Fantastic!!! For eight years I have been lovingly growing tomato plants (old varieties), which grow superbly in expensive tomato compost and form fruits but then began to rot, until I'm forced to throw them in the bin, swearing never to grow tomatoes again. This year too the plants grew strongly and produced fruit, and the first three plants already had rotten tomatoes ... After a girlfriend recommended your products, I immediately ordered the remedy. It arrived but I could only add two (instead of the recommended five) doses to the water because I was then away for ten days. I imagined that I would have to throw the tomatoes in the bin on my return... but nothing of the sort! I arrived home to find not a single brown tomato! I'm really excited. Finally I can enjoy healthy tomatoes – kilos of them. Many thanks for this great product! What fascinated me most was the treatment of a tomato plant that was almost about to die. Tomato blight had spread widely in the lower part of the plant, and the little leaves at the top already had small brown spots. At this point the tomatoes had not yet set fruit. I watered the tomatoes, which were growing in a plastic housing with one side open, on four consecutive days with Carbo veg. 30 C, (5 pellets in 1 litre of water, dissolved in a watering can). The plant then developed numerous fresh green leaves, and the leaves affected by blight fell off. It recovered completely, even becoming the best tomato plant in our garden. This experience was a “revelation” for me and it also convinced my husband to continue with homeopathy. Another tomato plant had something like water-filled brown spots on the underside of the fruits, and these spread from below to cover the tomatoes as they matured (picture 1). This plant was treated starting on August 4, 2013 for four consecutive days with Carbo veg. 30 C. For a long time it looked as if there was no improvement. But now, three weeks after applying the remedy, it has become clear that – although a few tomatoes still have brown spots below – they appear to have dried up and are no longer spreading to cover the entire tomato (picture 2). The younger tomatoes are completely healthy (picture 3)! 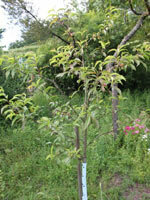 A young pear tree was affected by pear trellis rust in the first year after planting. This fungus affects the branches of various species of juniper, with the spores being transmitted on the wind to the leaves of pear trees. Ms B. 's neighbour had such a juniper in her garden. 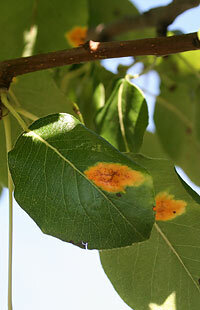 Initially the leaves showed light orange-red spots at the tips of the leaves, which then gradually enlarged, spreading over the leaves of the tree. Later long growths could be seen on the undersides of the leaves. The rust attacks recurred in the following years. The tree had scarcely any leaves, the fruit did not grow well, falling off early, and Ms B. was about to give up and cut the tree down. In the spring of 2012 she watered her pear tree following the recommendations of Christiane Maute (Homeopathy for Plants) twice with 8 pellets of Carbo vegetabilis 30 C in 30 litres of water, at an interval of one week. After a short time, the rust on the leaves diminished. The leaves gradually became greener and thicker. The tree seemed to be recovering. A few pears fell off again but in autumn she was able to harvest a good number of pears and she was pleased by how the tree was looking. The tomato plants were watered straight after planting and 6 weeks later with Carbo vegetabilis 30 C (5 pellets in 5 litres of water), as recommended by Christiane Maute. So far there has been no sign of tomato blight, despite the dense planting in a greenhouse. The tomatoes are firmer than ever and have so many fruit that they even need to be supported. This combination preparation, developed by an organic agricultural consultant from New Zealand, has proved useful in tests for the treatment of various fungal diseases such as false and true mildew, as well as Botrytis. Fungi-No fruit growing: An organic agricultural consultant from New Zealand developed this preparation after many years of tests on his orchards. 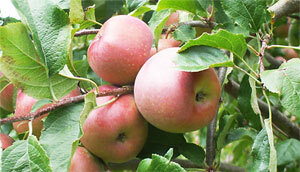 The “Fuji” variety of apple, which is normally very susceptible to scabs, remained largely scab-free thanks to treatment with this product. 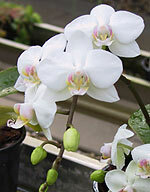 He sprayed three times before flowering and three times after flowering – mainly after periods of susceptibility to infection (sultry, rainy conditions) – with 50 ml of the preparation in 100 L of water. Fungi-No was developed by an organic agricultural consultant from New Zealand after many years of tests in viticulture. There is one mixture to spray before flowering and one to spray after flowering. In this year's tests, in which several organic wine-growers took part, the method of application was similar to that used for the spraying of copper and sulfur: multiple times prophylactically, starting from the 3-leaf stage, after periods of susceptibility to infection (dosage 50 ml preparation to 100 L water, averaging 400 L of the solution per hectare for each spraying). 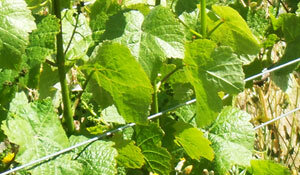 The plants remained free of false mildew and Botrytis. Hepa sulfuris 30C: For fungal attack, I have used Hepa sulfuris 30C (3 pellets /10 liters water) for several years with very good results. I need to apply it only once or twice. A cherry tree had been afflicted for 4 years with shot hole disease, which is a fungal disease resulting in red-brown spots on the leaves – the spots then break open, leaving holes, causing the leaves to prematurely turn yellow and fall off. Rose leaves showed a coating of white mildew. 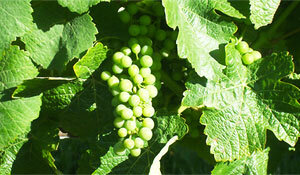 It was sprayed 2x, once each week, with Sulphur 30 C.
The fungus stopped spreading and the new leaves were healthy. 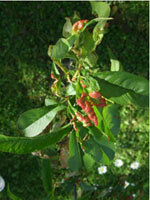 I watered a peach tree badly affected by curly leaf disease for 4/5 weeks with Thuja 6D. About every three to four days, I made a solution of one capful (approximately 1 ml) diluted in 1 litre of water, and applied it directly and carefully round the trunk of the tree. I also gradually removed the affected leaves. 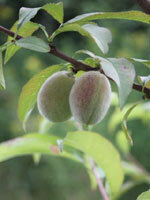 In her garden Ms Hemmerle has a peach tree, which was affected by leaf curl (also known as curly top). In 2012 about 1/6 of the leaves were infected and also the new leaves had the typical swollen red bulges. In 2013 the tree initially had normal leaves until in June around half the leaves began to show the symptoms of leaf curl. Ms Hemmerle sprayed the peach tree twice at an interval of 10 days, following the recommendations of Christiane Maute, with Thuja 30 C (6 pellets in 10 litres of water), tipping the remains of the spray solution into the root area of the tree. The affected leaves fell off gradually, with the new leaves developing well – in contrast to the previous year, they were completely healthy. This year (2014) she will treat the tree preventively and then she will check whether leaf curl returns or not. 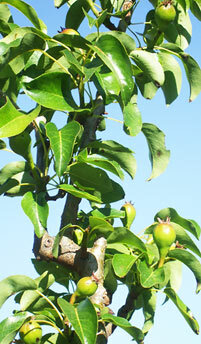 The leaves of a pear tree were affected by pear trellis rust in spring. 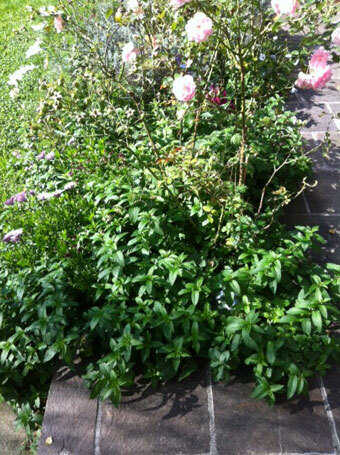 It was successfully treated with Gelsemium 200 C.
The affected leaves died off and the new growth was healthy. A short while later the tree was affected by monilia, causing the tips of the leaves to shrivel.